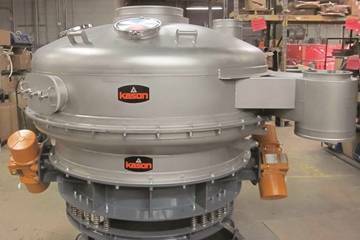 A new Vibroscreen Low-Profile Pressure Sifter from Kason removes oversize particles at ultra-high rates. The sealed system can be employed to operate under a blanket of an inert gas, to prevent the escape of hazardous gases and/or to sift in-line with pressurised reactors. Capable of scalping bulk materials at rates to 50 tonnes per hour, the 183 cm diameter unit is engineered and constructed to operate under pressure on a batch or continuous basis. Connections to the incoming line, discharge line for on-size particles, and discharge spout for oversize particles are sealed using flexible pressure sleeve connectors. The low profile "Flo-Thru" design employs two unbalanced-weight gyratory motors mounted on opposing exterior sidewalls of the unit, instead of one motor positioned beneath the screening chamber, reducing minimum height requirements significantly. The design also aligns the top inlet above the bottom outlet, allowing on-size material to descend through the screen in a straight-through path at high rates. Oversize material is ejected through a spout at the periphery of the screen. The Pressure Sifter is offered in stainless steel and carbon steel in diameters from 460 to 2135 mm. The company manufactures numerous types and sizes of gravity-fed, in-line-pneumatic and in-line-pressurised circular vibratory screeners and centrifugal screeners for separating solids from solids or slurries, as well as circular fluid bed processors for batch or continuous drying or cooling of bulk solid materials.